We have been asked about AHD and what it is used for in CIT “non-strip” hair transplant method. The principal factors to consider when designing the hairline that frames the face or forehead are the mid-frontal height of the hairline, the width of the frontal hairline be­tween the recession points, the irregularity of the hairline, the temple point location, the temple angle. the hairline.Below is information on just one of our many products that are directly involved with producing our consistently natural-looking results. This particular device removes much of human error when designing the most important part of restoring male pattern baldness. To assist in creating a symmetrical hairline quickly, we developed a template called the “Aid to Hairline Design” (AHD) (Figure I ). What is AHD? This is a simple, straightforward method of drawing the hairline, and is also a tool that can be used to assist in the design of the temple and areas of the recession. The AHD template is made up of a clear plastic film capable of bending to partially conform to the facial curvature. 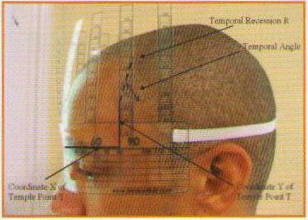 The transparency of the film allows one to see and review the designed hairline. It has horizontal and vertical scales spaced appropriately, to measure and mark points. The template. at its mid-section, has a feature extending downward that may be aligned with the vertical nasal axis to secure the horizontal symmetry. The template is then placed with the horizontal reference line set along the glabella on a level line. Numerous additional equidistant lines inferior to this allow the physician to ensure that the above-mentioned baseline is truly horizontal. One may orient these inferior lines so that they are symmetrical with respect to their location at the outer canthus or numerous other landmarks such as the pupil. the medial canthus, or the orbital margins above or below as shown in Figure 2. Once the alignment is done, the template is secured in position around the head. We created two versions: one is disposable and utilizes double-sided tape in the frontal area. and the other is reusable featuring an elastic band and a Velcro locking system that extends around the head. The disposable version is best used if the patient has already had any donor harvesting done, as that would potentially contaminate the elastic band of the reusable version. Once the AHD is secured properly with respect to the facial landmarks, the hairline mid-frontal point is marked on the central scale. Additional symmetrical points are marked on the lateral sides (Figure 3, A and B). 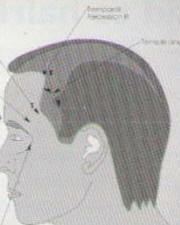 The head position or orientation of the patient does not affect the hairline design because the AHD is secured with respect to the facial features as shown in Figure 2. This is definitely an advantage over non-contact techniques. such as laser projection, which prohibit any motion of the patient until the hairline design is finalized. 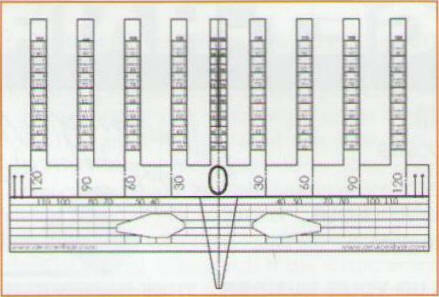 AHD helps also to reproduce or copy the temple point and recession point from one side to the other. Determine the point on one side using any of the available methods or by visual inspection. Identify the horizontal and vertical coordinates x and y, respectively, to the template point, T. The horizontal, or x, coordinate is measured from the center of the nose at the glabella and may be a certain distance from the lateral canthus or the lateral orbital hone. 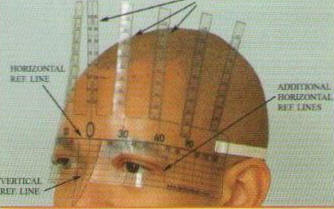 The vertical, or y. coordinate is measured from the reference line through the glabella upwards to the temple point. The respective coordinate points are reproduced on the other side as shown in Figure 4. The frontotemporal recession point ® may he the virtual in­tersection point of the frontal hairline and the inclined temporal line. The temple angle (0). shown in Figure 5, may be between 55° and 75° from the horizontal plane. The vertical and horizontal projections of the temporal line may he given by TRsin 0 and TRcos 0, respectively. The same principle used to reproduce the temple point to a symmetric position may he ap­plied to reproduce the horizontal and verti­cal coordinates x and y, respectively, of the recession point. In summary, it is of great value to produce a useful. reproducible. hairline template dur­ing the surgical construction of what is probably the single most important feature of a hair transplant. The AHD may actually he placed on the patient, so that the individual, anatomical variations of the facial, skull, and scalp struc­tures are honored and taken into account during the creation of the hairline. This is offered as a superior alternative to the less objective and less reproducible technique of visual inspection and freehand drawing. The AHD method saves significant time and consistently produces a natural, aes­thetically pleasing and symmetric result. Dr. Cole is a sponsoring physician of HairSite. I would pay you decent $$$ if you would do my research paper for me. » template called the “Aid to Hairline Design” (AHD) (Figure I ). » the temple and areas of the recession. » aligned with the vertical nasal axis to secure the horizontal symmetry. the device does seem to make sense,but imho all the hairlines given by nature have some degree of asymmetry in design…which i believe is imp to keep when designing hairline! I think that a couple of these should be bought by a couple of doctors who come to mind! I swear many of them need it. Nice stuff here for Sure. » » male pattern baldness. » » template called the “Aid to Hairline Design” (AHD) (Figure I ). » » the temple and areas of the recession. » » aligned with the vertical nasal axis to secure the horizontal symmetry. » keep when designing hairline! oh boy, I have a headache just looking at the pics! This is pretty cool because you can tell where your future hairline can be. Come to think of it, I’m very curious as to why market a such product directed towards hair transplant surgeons only? If the product costs were in the thousands or tens of thouands, then I can understand; or even if the product needed to be replaced on a constant and periodic bases at a lower cost, then we have a decent sum of gross being generated in consecutively. This product only costs, what - $20?? I can’t see this product being bought repetively either. So why create such thing and try to sell it amongst hair transplant surgeons when there’s barely any profit to be made compared to cosmetic surgeries (ie hair transplants)?? Please don’t say “because we care and want them to do it the correct way”. Many surgeons have quite distinctive tools and methods of rendering their cosmetic surgeries, rarely do they try to implement other surgeons to use it or attempt to sell it to them - unless ofcourse two things: 1) it is very profitable or 2) just to say “i made it” - publicity. This thing sounds beasically useless, if a cosmetic doctor cannot see a guy and understand where his hairline should be placed immediately and he needs AID then he is not a good cosmetic doctor.